Ultra Series Connector - combines 2 battery packs with red T connector and DOUBLES the voltage Output. Ultra T Parallel Connector - combines 2 battery packs with red T connector and DOUBLES the Capacity. Voltage remains the same. 1S300W: 3.7 volt 300mAh 20C rechargeable Li-PO battery for RC drones, quadcopters, helis, planes, Traxxas Drone QR1. Battery dimensions: 1 3/8" long, 3/4" wide, 1/4" thick. Weighs 0.325 ounces. BMCX130 : 3.7v 130mAh rechargeable Li-POLY battery for micro Helis, Planes, QuadCopters, etc. Only 1.25" long ! 1S180C: 3.7volt 180mAh 50C Li-PO battery for micro Quads, Helis, Planes, etc. 1 5/8" long; weighs 4.5 grams. Has micro JST white connector. Replaces/upgrades the 130mAh, 150mAh, & 160mAh batteries. EXCLUSIVE from Batteries America. x-ref # BMCX180. BMCX160 : 3.7 volt 160mAh Lithium Polymer battery for Micro Helis, etc. BMCX160: 3.7 volt 160mAh 25C rechargeable Li-PO battery for Micro Helis. Designed for E-flite Blade MSR, E-flite 4-SITE Biplane, Parkzone Sukhoi 26M 3D, etc. Battery length = 1 5/8". BPNE160: 3.7v 160mAh rechargeable LiPO battery for Heli-Max, Nine Eagles etc. OUT OF STOCK. BPNE160: 3.7v 150mAh rechargeable LiPO battery for Heli-Max, Nine Eagles flying models etc. Replaces HMXP1007, NE-B109 etc. 1S200MJST : 3.7v 200mAh Li-POLY 1S rechargeable Battery (30C) for Helis, Planes, Quads. 1S750JST: 3.7v 750mAh 30C rechargeable Li-PO battery for RC drones, quads, helis, planes. Size: 44mm x 24mm x 9.8mm. Weighs 0.66 ounces (18.6 grams). Has red JST power connector. 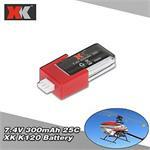 K120-010: 7.4 volt 300mAh LiPO battery for XK K120 RC heli. Size 52mm x 21mm x 12mm. Weighs 17 gms. 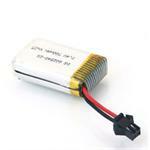 1S850JST : 3.7v 850mAh Li-PO battery with JST - for RC Quads Helis Planes etc. Size: 2" long, 1.15" across, 0.25" thick. Weighs about 1 ounce. 2S500WA: 7.4volt 500mAh 25C Li-PO battery for JJRC quadcopters. Includes black wing (Wattage) connector. For F182, F183, H8C quadcopters & more. 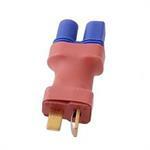 Size: 1.69" x 0.98" x 0.47" (43mm x 25mm x 12mm). Weight: 1.6 ounces (46gm). 2S200JST : 7.4 volt 200mAh rechargeable Li-PO battery for electric flight. Includes JST conn., Balance conn., and eFlite conn. X-ref part # 2LP352211. 1S250MICJST : 3.7v 250mAh Li-POLY 1S rechargeable Battery (15C) for Micro-Helis, Planes. 2S250JSTW: 7.4volt 250mAh LiPO battery with JST white conn.
2S250JSTW: 7.4volt 250mAh LiPO battery with JST white connector & balance charge connector. 1 1/2" x 3/4" x 7/16"; weighs 17gms. 2S800JST: 7.4 volt 800mAh LiPO battery 25C with red JST connector & balance charge connector. Dimensions: 2 7/8" x 1" x 1/2". Weighs 1.7oz (49gms). 2LP63472P4H5R: 7.4volt 1000mAh 30C LiPO battery for RC. Weight 1.9 ounces. Size: 2" x 1" x 5/8". Includes White Balance charge connector and choice of Motor connector (see menu). 2LP900JST: 7.4 volt 900mAh 25C Lithium Polymer motor battery w/ Balance Charging connector & Red JST motor connector. For Electric Flight. Dimensions: 75mm long x 25mm across x 12mm thick. 2S500JST : 7.4 volt 500mAh 25C Li-PO Battery with red JST connector & Balance Charge connector. Size: 2.125" x 1.125" x 0.437". Weighs 1.36 ounces.